Technology foresight has been stuck for the last 10-20 years; we need to be paying more attention to social-cultural futurism. Foresight is not about making predictions. Rather, it's a tool for identifying dynamics of change, in part by exploring the implications of those changes. This is a point I've made often enough that even I'm sick of it -- but it remains an idea that not enough people understand. It's next to useless to say "X will happen;" it's much more valuable to say "here's why X could happen." One of the trickier aspects of this formulation of foresight is the need to keep an eye on how the dynamics of change themselves are evolving. It's easy to get locked into a particular idiom of futurism, calling upon standard examples and well-known drivers as we work through what a turbulent decade or three might hold. It's comforting to be able to go back to the old standbys, confident that the audience can sing along. Nowhere is this more visible than in the role technological change plays in futurism. The big picture visions of what the next 20-50 years could hold in terms of technologies haven't changed considerably since the beginning of the century, and (for the most part) since the early 1990s. Moreover, what we've seen in terms of real-world, actual technological change has been largely evolutionary, not revolutionary. Or, more to the point, the revolutions that have occurred have not been in the world of technologies. I could go on, but you get the picture. All of those technologies appeared in the "hard science" science fiction game series Transhuman Space, which I worked on in 2001 to 2003. Most could easily be found in various "what the future will look like" articles and books from the late 1990s. Since then, some of those concepts have turned into reality, while others remain on the horizon. But pin down a futurist today and ask what technologies they expect to see over the next few decades, and you'll get a remarkably similar list -- often an identical one. As a telling example, the list above could serve as a rough guide to the current curriculum of the Singularity University, minus the investment advice. There hasn't been a ground-breaking new vision of technological futures in at least 10 years, probably closer to 15; nearly all of the technological scenarios talked about at present derive in an incremental, evolutionary way from the scenarios of more than a decade ago. The closest thing to an emerging paradigm of technological futures concerns the role of sensors and mobile cameras in terms of privacy, surveillance, and power. It's still fairly evolutionary (again, I could cite examples from Transhuman Space), but more importantly, it's much more about the social uses of technologies than about the technologies themselves. The effective collapse of American hegemony. The inability/unwillingness of world leaders to respond to global warming. The death spiral of the European Union. Major changes to global demographics, especially population forecasts. The unregulated expansion of financial instruments based on little more than betting on other financial instruments. That the Koreas would remain divided. That there hasn't been a major biological, radiological, or nuclear terror event. The speed of urbanization, especially in the developing world. The Arab Spring, Occupy, Tea Party, and similar bottom-up political movements. And on and on. If futurists have become almost too good at technological foresight, we remain woefully primitive in our abilities to examine and forecast changes to cultural, political, and social dynamics. Why is this? There isn't a single cause. Some of it comes from a long-standing habit in the world of futurism to focus on technologies. Tech is easy to describe, generally follows widely-understood physical laws, offers a bit of spectacle (people don't ask about "jet packs" because they think they're a practical transit option! ), and -- most importantly -- is a subject about which businesses are willing to pay for insights. Most foresight work is done as a commercial function, even if done by non-profit organizations. Futurists have to pay the rent and buy groceries like everyone else. If technology forecasts are what the clients want to buy, technology forecasts will be what the foresight consultants are going to sell. Another big reason is that, simply put, cultural/political/social futures are messy, extremely unpredictable, and partisan in ways that make both practitioners and clients extremely vulnerable to accusations of bias. We're far more likely to make someone angry or unhappy talking about changing political dynamics or cultural norms than we are talking about new mobile phone technologies; we're far more likely to be influenced by our own political or cultural beliefs than by our preferences for operating systems. One standard motto for foresight workers (I believe IFTF's Bob Johansen first said this, but I could be wrong) is that we should have "strong opinions, weakly held" -- that is, we should not be locked into unchanging perspectives on the future. Again, this is relatively easy to abide by when it comes to technological paradigms, and much harder when it comes to issues around human rights, economic justice, and environmental risks. Lastly, there's a strong argument to be made that futurism as practiced (both the the West and, from what I've seen, in Asia) has a strong connection to the topics of interest to politically-dominant males. It would be too easy to caricature this as "boys with toys," but we have to recognize that much of mainstream futures work over the past fifty years (certainly since Herman Kahn's "thinking the unthinkable") has focused on tools of expressing power, and has been performed by men. This is changing; the Institute for the Future employs more women than men, for example. In many respects, futurism in the early 21st century seems very similar to historiography in the post-WW2 era: still dominated by traditional stories of power, but slowly beginning to realize that there's more to the world. Howard Zinn was a highly controversial historian, but even those who hate his work can admit that he popularized a perspective on history that simply hadn't received much attention beforehand. History can be about more than what Great Leaders did and said, which Great Wars were fought, and how Great Events Turned the Tide of History; history can be about how regular people lived, slowly-changing shifts in belief, and the complicated aftermath of the Great Moments. Similarly, futurism can be -- needs to be -- about more than transformative, transcendental technologies. 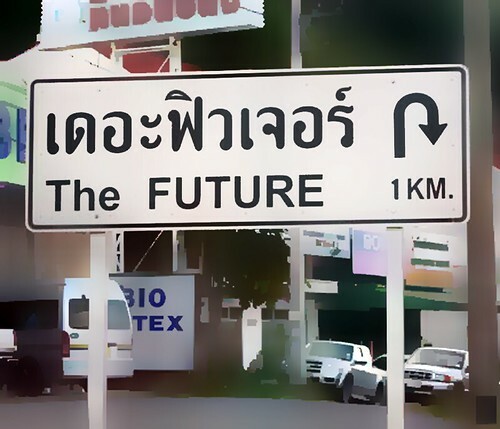 There's no doubt that social futurism is significantly more difficult than techno futurism. Without a clear model for socio-cultural change, and absent the appearance of a Hari Seldon complete with almost infallible mathematics of social behavior*, we have to go by experience, gut instinct, and the intentional misapplication of training in History, Anthropology, Sociology. But that doesn't mean that good social futurism is impossible; it just means we have to be careful, conscious of the pitfalls, and transparent about our own biases. * Void in the case of the Mule. Our tools don’t make us who we are. We make tools because of who we are. Cyberculture legend RU Sirius, editor at the Acceler8or webzine, interviewed Joel Garreau and myself about the Prevail project. (Short summary for those who missed the earlier post: Prevail is an Arizona State University-sponsored non-profit organization looking to build collaborative knowledge about transformative technologies and culture.) In a series of back-and-forth email among the three of us, we discussed everything from the logic of transhumanism to the power of the Occupy movement. The heart of Prevail is: perhaps there are two curves of change, not one. If our technological challenges are heading up on a curve, but our responses are more or less flat (like we’re waiting for House Judiciary to solve our problems), the species is clearly toast. The gap just keeps on getting wider and wider. But suppose we are seeing an increase almost as rapid in our unexpected, bottom-up, flock-like social adaptations. Then you’d be looking at high-speed human-controlled co-evolution. There are reasons for guarded optimism about this. In other words, we can't wait for someone else to give us the future; we have to make it ourselves. The title of this post is one of my comments from the interview. It comes down to humanism. One bit of snark I’ve used before is that transhumanists focus too much on the “trans” and not enough on the “humanist.” As I said earlier, I’m more adamant in my anti-Singularitarianism than in my anti-Transhumanism, but in both cases it’s not because I reject the notion that our technologies are changing rapidly. It’s because I firmly believe that it’s not a one-way process. Technologies change us, but we change the technologies, too. Technology is not an external force emerging from the very fabric of the universe (and, as you know, there are some Singularitypes out there who seriously believe that Moore’s Law is woven into the laws of nature); our technologies (plural, lower-case T) are cultural constructs. They are artifacts of our minds, our norms and values, our societies. Our tools do not make us who we are. We make tools because of who we are. It was a good conversation. Thank you to RU for inviting me along, and thank you to Joel for tolerating my presence!